The objective of this chapter is to teach the readers to learn to operate scanning of the adrenal glands and organs in retroperitoneal space, and recognize the image figures. The contents contain the scanning method, section structures, measuring method and normal, and clinical application value of the retroperitoneal space.There are the pancreas, duodenum, adrenal glands, kidneys, and large blood vessels in the retroperitoneal space. 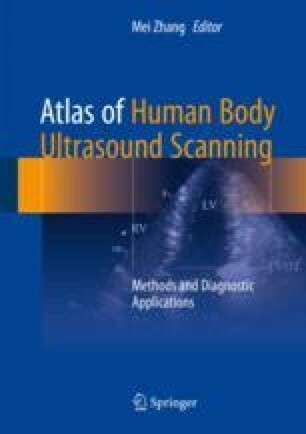 The patient’s position and preparation before examination, the location and direction of the transducer are described in the scanning methods. The scanning range includes the scans on upper abdomen, middle abdomen, and lower abdomen. Transversely, longitudinal and oblique scanning methods are introduced. The section structures show the location of every cavities of the retroperitoneal space and the landmark for judging the organs in the retroperitoneal space. The measuring methods and normal describe the specification requirement of measurements in standard section and the normal range.